The Baja Mosquito Fleet sport fishing report brings you the latest in fishing conditions in the Sea of Cortez surrounding La Paz. 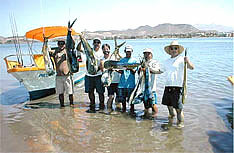 From Cerralvo Island to El Bajo, north of Espiritu Santo, great fishing can be found, almost year round. Enjoy the thrill of catching marlin, yellowfin, yellow tail and dorado with some of the most experienced fishermen as your guides. Remember, a bad day fishing is better than a good day at work! Come join us soon.